This arch on the Beachy Head cliffs is made of fallen boulders. It is possible to pass through the arch from one side to the other. Grid square TV5795, has some varied and rare features which make it particularly interesting. Erosion on this high energy stretch of coastline has carved natural arches within sight of Beachy Head Lighthouse. Such features are quite rare on the Sussex coast. Natural arches are temporary features and are part of a developmental process which, through a series of stages, leads to their ultimate disappearance. Earlier this year, the natural arch, which was still standing intact, broke at the weakest part on the curved arch and it has now become a stack. On average, the chalk cliffs are receding at a rate of approximately ½ -1 metre per year. Close to the natural arches there lies the remains of a large cliff fall. Such a pile of fallen rock and the fact that it is reduced in size, year by year, are clear indicators that coastal erosion is active at this location. The outer edge of the extensive wave-cut platform marks the edge of where the cliffs once stood. Both the cliff top area and the beach below present some danger to the public. The cliff edge is largely unfenced and the open nature of the cliff edge presents a danger to the unwary, to the curious who may be drawn to the edge in order to view what lies below and to those who have come there without intending to return. Unexploded ordnance from WW2 and the Battle of Britain are occasionally found in this area. On the beach, dangers may also come from live ordnance, falling rocks and cliff collapse and from being cut off by the rising tide. The modern practice of taking “selfies” has become a safety issue because many individuals take their photos from a perilous position on the crumbling cliff edge. With these many and diverse dangers, it is reasonable to ask what is the best plan and package of protective measures that can be devised and what resources should be allocated to implement them? On nearby Seaford Head, for instance, there have been some recent, huge rockfalls with one alone estimated at weighing 500,000 tons. Here the unstable area has been fenced off and security guards have been employed to talk to the public about the dangers and the need for safety. The use of warnings in different languages is one aspect of this approach. Do you have any useful suggestions to contribute to the issue of safety on the beaches and cliff edges? Shooters Bottom is a clearly defined dry valley and one of many dry valleys that give variation to the topography of grid square TV5795. The dry valleys are a relic of the Ice Age. As chalk is a porous rock any surface water seeps into it and this process accounts for the absence of surface streams and rivers. The cliff edge near Shooters Bottom shows the effects of biological weathering in the form of many rabbit burrows. Unusually one of those burrows, on the exposed cliff edge, has been eroded by wind action and this has reduced the burrow to surviving arches. 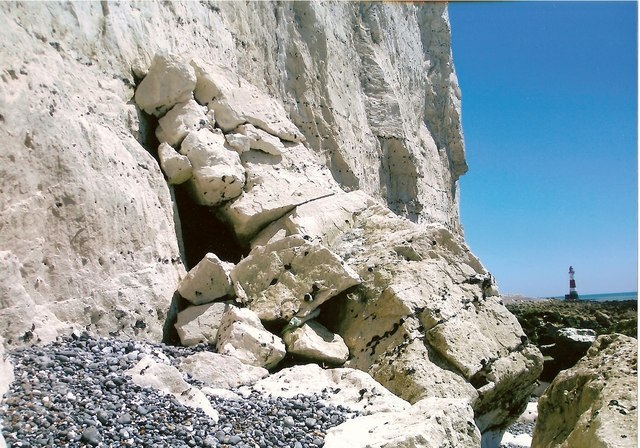 The loose soil created by rabbit burrows coupled with strong winds on the cliff-top has resulted in a series of deflation hollows along the cliff edge. The loose soil is transported from the cliff edge by the wind until an underlying, armoured surface of flint is exposed. Another nearby example of biological weathering has resulted from walkers on the South Downs Way wearing away the grass cover and causing a linear, shaped rut to form in the underlying chalk. Hodscombe Farm is the principal farm in the grid square and the most extensive land use is that of agriculture. Typically the chalk grassland is used for grazing livestock such as sheep and cattle. There are a number of dew ponds in the wider area but in TV5795 water is typically made available to livestock through the use of drinking troughs. The grassland is species rich and contains plants of extremely restricted national distribution. Prime among these are various species of orchid and the rare, umbellifer moon carrot. Patches of scrubby vegetation such as at Shooters Bottom and inland provide shelter for migratory birds. In the northeast of the grid square, and spreading into adjoining areas, are the outlines of ancient field systems. These have been researched and are identified as belonging to the Iron Age and to the Romana-British period. Together with nearby evidence of settlement and trackway, these remains provide important evidence of how the landscape was reorganised during those times. Grid square TV5795 provides good access to the public. Walking on dry, chalk downland is a popular pursuit and grid square TV5795 provides easy access to the public. The route of the B2103 makes use of the dry valley known as Hod Combe and it is the principal, coastal road in TV5795. The area is well served by buses, car parks and public rights of way including the South Downs Way and a number of smaller tracks and bridleways.